Are you ready to design your beautiful low maintenance deck? Happy St. Patrick’s Day! Are you feeling lucky? At Mid-Atlantic Deck and Fence, we think there are few things luckier than being able to invest in a high quality feature for your home that will increase its value AND require little maintenance. Is caring for your current deck a hassle? Are you looking to implement affordable low maintenance decking on your property? You’re in luck. Read on for more information about our low maintenance composite decking. Your deck is an extension of your personality and home and should be designed with that in mind. It can increase the value of your home and provide you with an absolutely amazing space to entertain friends and family. If you spend your time cleaning, sanding, staining, or resealing your worn out deck – you are wasting your time! There are several low maintenance decking options that require minimal maintenance, leaving you more time to enjoy your space. 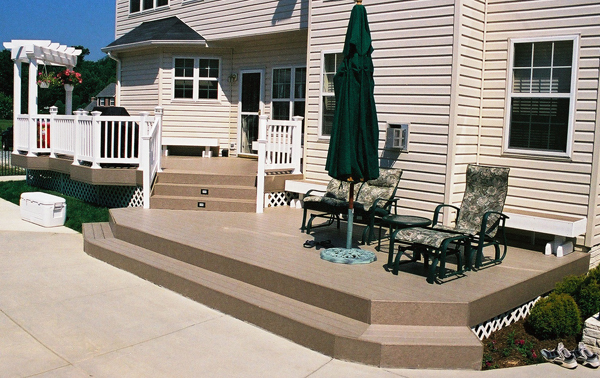 We have one of the largest inventories of low maintenance composite decking products in Maryland, just stop by our showroom and see for yourself! We have an indoor showroom and outdoor display that will help you choose which low maintenance decking option best suits your needs and budget. We can satisfy any of your major or minor decking needs with further design options like: planter boxes, pergolas, benches, lighting, built-in bars, or pagodas. Are you fed up with your old deck? 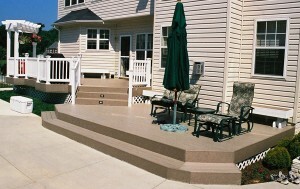 Lucky for you, we offer re-decking services! We can use your existing deck frame and apply one of the several low maintenance decking and railing products we offer to it. Let us transform your old deck and make it look brand new again.